When I was growing up, if it was Thanksgiving, or Christmas, or a roast dinner my mom would make, and she still makes, these carrots roasted with onions, brown sugar, and tons of butter! Oh what happy-delicious memories those carrots bring. I do love those carrots, and have eaten them often, but I wanted to change them up just a little; but they still need to be familiar, cuz I don’t want anybody in the family freaking out…You know how we get about those certain holiday dishes. Like I said, Mama’s carrots are drowning, in a good way, in butter. I found that by using maple syrup instead of brown sugar, I could get away with using just a smidge of butter and not sacrifice any flavor. 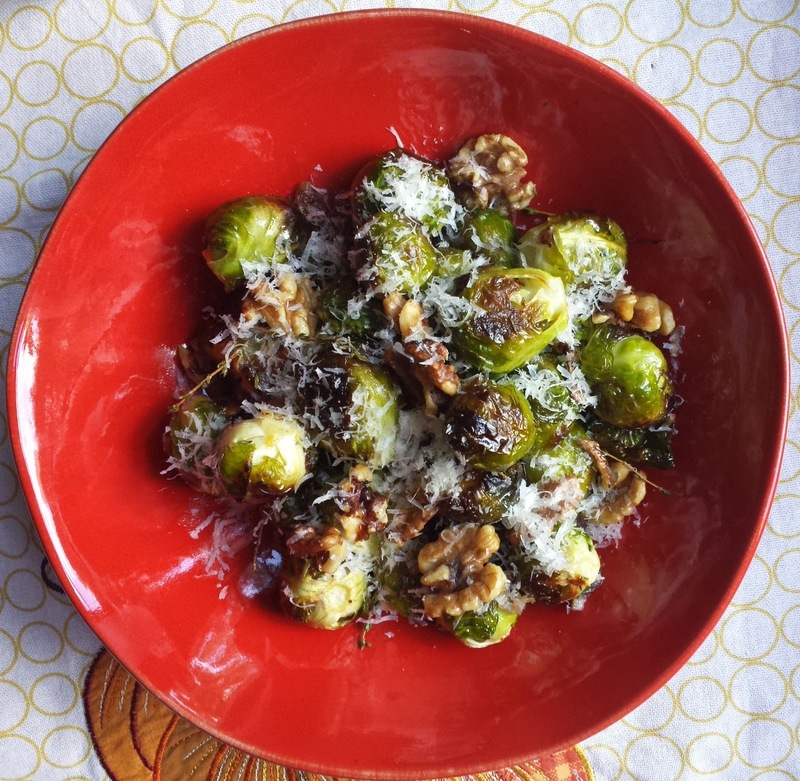 A touch of sour lemon and a hit of spicy chilies round out this side dish which will compliment all of those other rich Thanksgiving sides. I used half of a jumbo onion, and the onions take on the sweet maple flavor and are as much of a star of this dish as the carrots, so if you like onions you might like to use a whole one. The first time that I made Maple Chili Glazed Carrots, I added the chilies at the beginning of the roasting process and they permeated every bite, which was a little too hot; by adding the chilies before serving, you just get a hit of heat here and there which is much more pleasant. BTW the red chili is the one that looks like a red jalapeno and it's really hot; jalapeno is a less hot and a good alternative. If you’re serving these to kids, or anyone that is sensitive to spice, you can totally change out the chilies for some rosemary, thyme or tarragon. Honestly, Maple Chili Glazed Carrots are so close in flavor to Mama’s recipe, maybe just a little more elevated, that I don’t think that any of my family members will freak out about changing the carrots. Actually they might freak out, but freak out because they love them! Truth be told, that the moment that I was done photographing the Maple Chili Glazed Carrots, I demolished the entire bowl…they’re totally addictive! 2. Lay the carrots in the bottom of a baking dish equivalent in volume to an 8 x 8 x 2 inch pan, and place the onions on top of the carrots. Now pour the maple syrup evenly over the top, and season with salt & pepper. The onions should remain as the top layer. Cover with aluminum foil and roast for about 30 minutes. 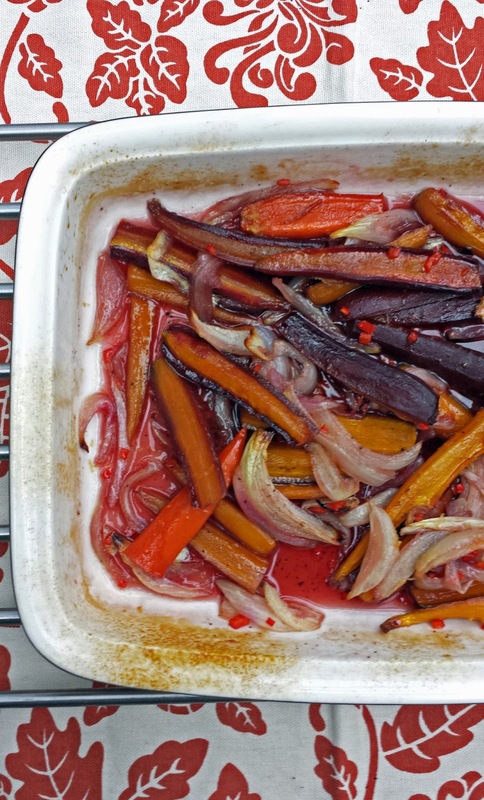 Remove the foil and roast for another 30 to 45 minutes, stirring once, until the carrots are tender. 3. 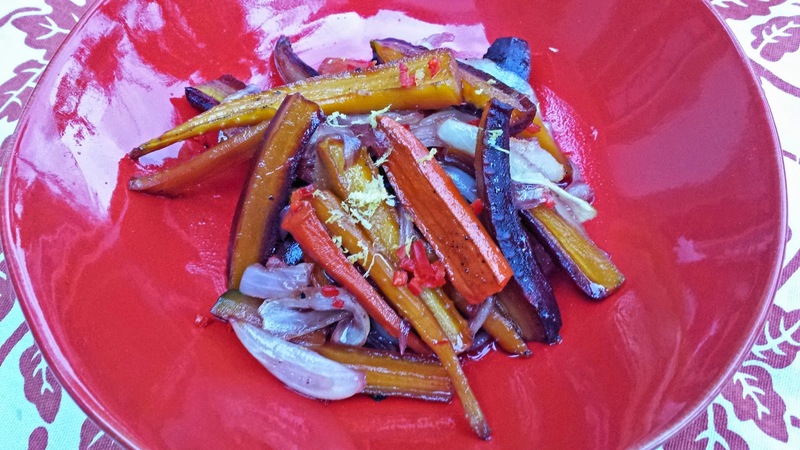 Remove the carrots from the oven and stir in the grated lemon zest, lemon juice and minced red chili. Notes: *Taste the chili before adding it to the dish, to determine how hot the chili actually is and then add as little or as much as you desire. ***This recipe is easily increased to serve a crowd but you may have to increase the roasting time. ****Last tip! 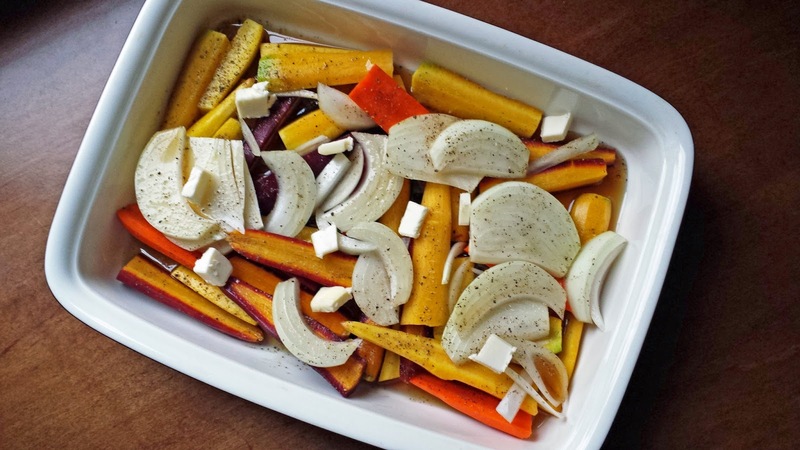 You may roast the carrots covered for 45 minutes total cooking time, a couple of days in advance, and on the day of bring them to room temperature, and heat them uncovered in the oven for about 30 minutes, but don’t add the lemon zest, lemon juice, or chilies until you’re ready to serve. See you convinced me just with the name alone! 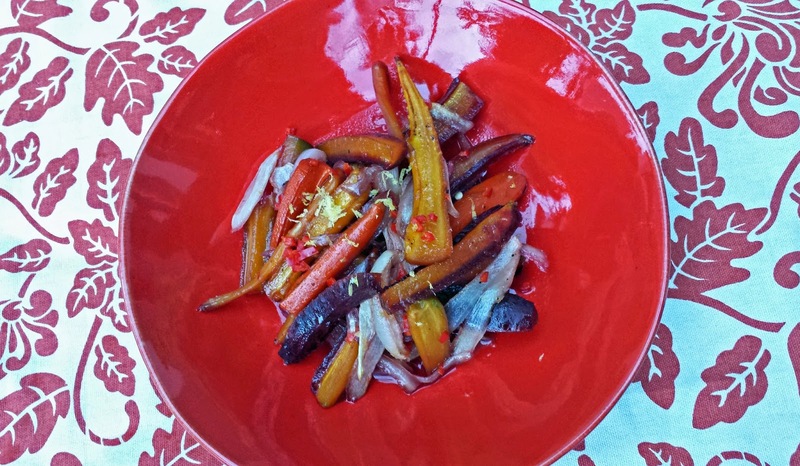 Maple chili carrots... I mean... who wouldn't want to eat those?? This sounds like an awesome combination! I really want to try this!